GetProgInfo (Windows Software Updater) utility searches for the latest versions (updates) for installed software on Microsoft Windows operation systems. It allows you to get these updates as soon as they released. 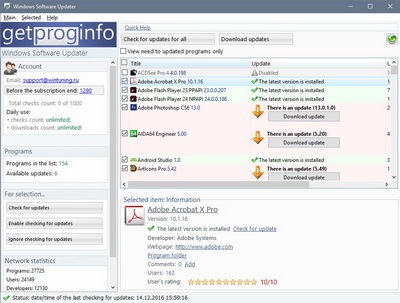 If there is an update, GetProgInfo utility will download it and the user can install it using the utility interface. Rating of programs, based on the quantity of users that use these programs (more users - higher rating). Rating of programs, based on the rating by users, scaled from 1 (bad) to 10 (excellent). Specialists in tweaking and optimization of OS Microsoft Windows since 2003.